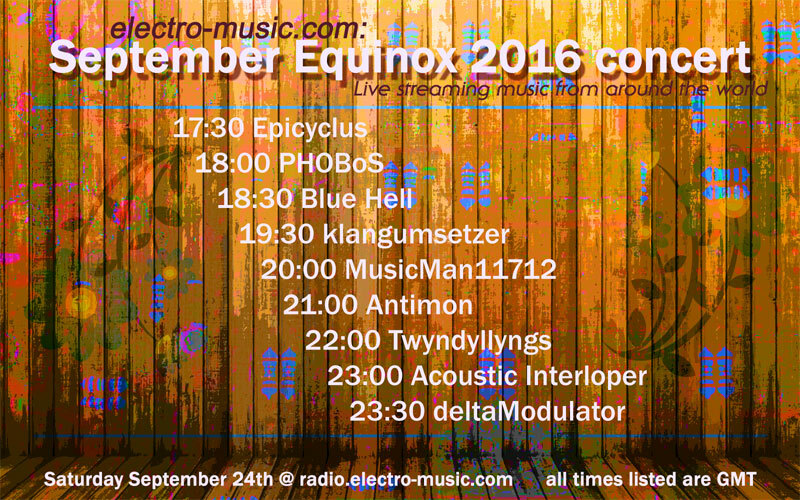 electro-music.com :: View topic - September Equinox 2016 live streaming concert. 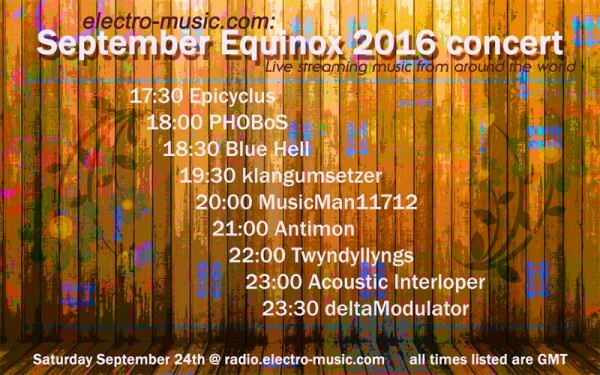 September Equinox 2016 live streaming concert. Posted: Mon Sep 05, 2016 3:50 am Post subject: September Equinox 2016 live streaming concert. The event will be on electro-music radio on Saturday Sep 24 2016.
if there are enough people signing up. Stream ops please respond if you able to help switch and what time range you are available. No really, it would be nice to have some more people to help with switching duties. As in the past, the chat room will serve as an invaluable communication tool for set up, streaming, and connecting to those listening....and it's just a lot of silly fun! I suggest participants get familiar with it in advance, if you aren't already. Performers MUST stream at 128 kbps, 44.1 kHz , stereo. more info about broadcasting on radio.electro-music.com can be found here. It is IMPERATIVE that everyone test their connections before we start streaming. At least 24 hours before but sooner is preferred. Sorry, but we can not guarantee that musicians will be allowed to stream if you do not test 24 hours before hand. Not only does it delay the schedule, but causes unneeded stress on performer, server operator, and audience during performance time. Join the chat room for testing and help setting up. 1. Preferred Start Time (Please use GMT/Military Time): Early-ish / any time 15:00 > 19:00. 2. Set Length (30 or 60 minutes): 30 mins. 3. Artist Name (For displaying on the poster): Epicyclus. 4. Chat Name (if different from artist/forum name): skrog productions. 5. Location (City/State/Country - Optional): Southern Scotland, UK. 6. Description (Style/Genre/Equipment, etc. - Optional): D.I.Y. 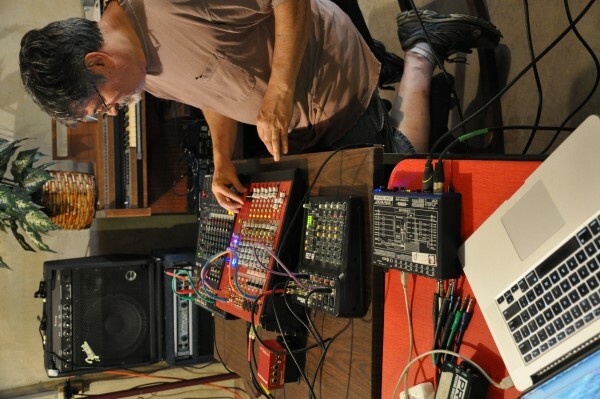 synths & sequencers. And if we end up being more than three performers, I can volunteer to learn how to streamop if needed. Ok I'd like to volunteer for streamopping then. I'll do something .. yeah I'll stream something .. when is it? Ah sep 24, that'll work! 1. Preferred Start Time (Please use GMT/Military Time): not really - not silly late please. 2. Set Length (30 or 60 minutes): 30 or 60, ok.
3. Artist Name (For displaying on the poster): Blue hell. 4. Chat Name (if different from artist/forum name): Jan.
5. Location (City/State/Country - Optional): some street in Enschede, the Netherlands. 6. Description (Style/Genre/Equipment, etc. - Optional): Organized noodle, prolly, but I need to think. 8. Anything else you like to mention: thanks, but nope. 8. Anything else you like to mention: we are electro-music.com! 1. Preferred Start Time (Please use GMT/Military Time): Roughly, before or after Chez Mosc, as it fits. Stefan gets dibs on 22:00. 2. Set Length (30 or 60 minutes): 30 for now. 8. Anything else you like to mention: See below. My son Jeremy and I are going to open our first batch of home recipe, home brewed ginger beer this Saturday. Musically, we run in parallel tracks rather than converging ones. 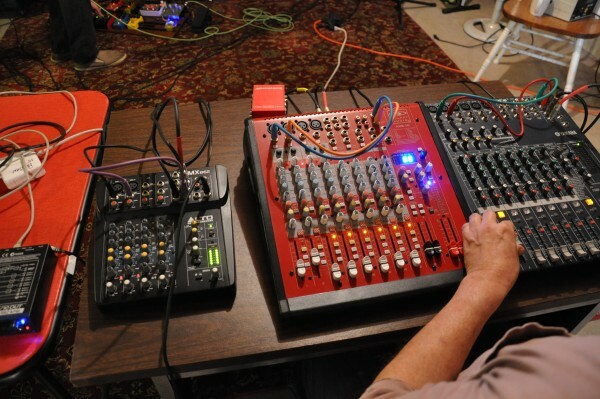 We did play the NYE 2007-08 webcast together (Chess-Generates-Music), and he helped me to premier the first electro-music zero input mixer collaboration with State Machine & John Driscoll in 2012. 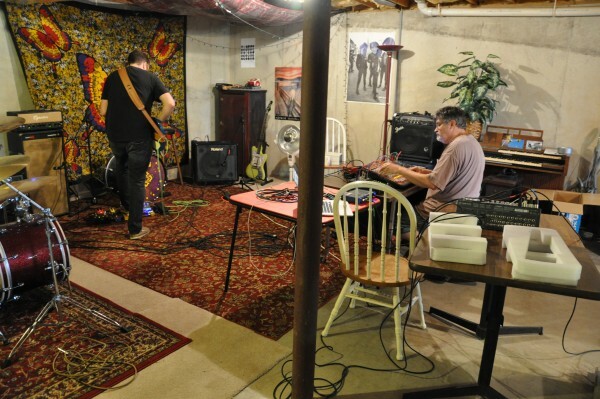 Jeremy has agreed to jam with me this Saturday and we will record the result and edit it down to at least 30 minutes this coming Saturday the 17th. I will stream that the 24th. It could go to 60 minutes. 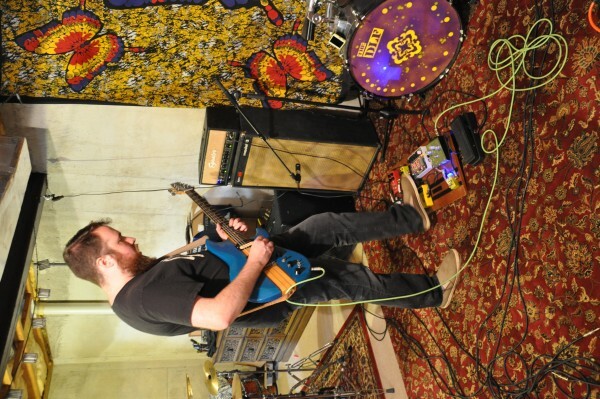 He plays killer FX-box-laden electric guitar in our basement every week or two. 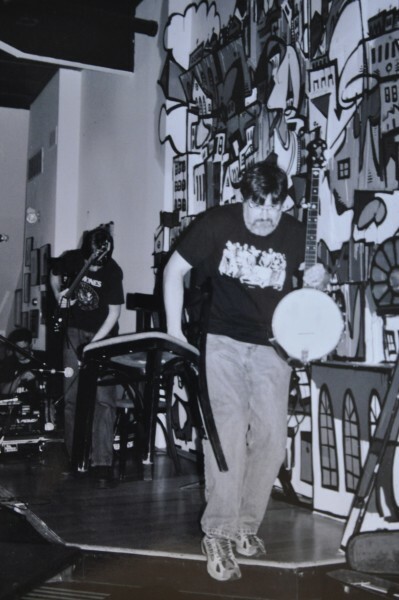 I plan to set up all 3 ZIMs in the basement on Friday, and I was working out a new swamp-timbre delay set of patches on the electronic banjo last night. I can't get him on the 24th, but I can get him this Saturday, and so there it is. He actually initiated my work in the planetarium as my university student. The Ginger Beer Session! Let's assume 30 minutes, and if it could go to 60, I'll ask. Jeremy Parson and I improvised for about 42 minutes yesterday. I have cut out the first 12 minutes, which were mostly warmup / fishing around, adjusted levels, and it's in the can, all improvised music for a 30 minute equinox set. 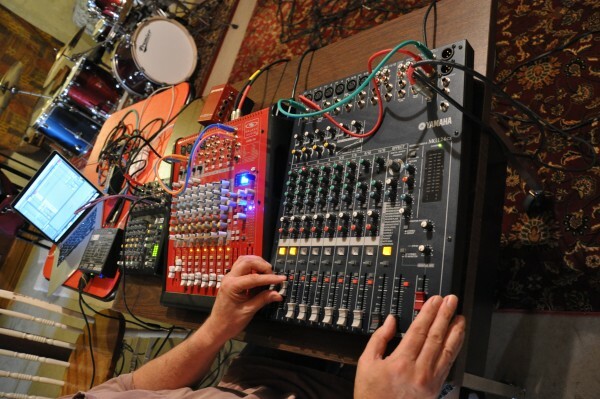 Jeremy played and Aria Thor Sound 400 electric guitar with a bunch of FX kick boxes bolted to a board, and I played my 3 zero-input mixers with no software processing. We used an assortment of 4 microphones, 3 at the amplifiers and one across the room, to record the session at a sampling rate of 48k. Photos below by Linda Parson. Lots of evening meetings this week, very busy. 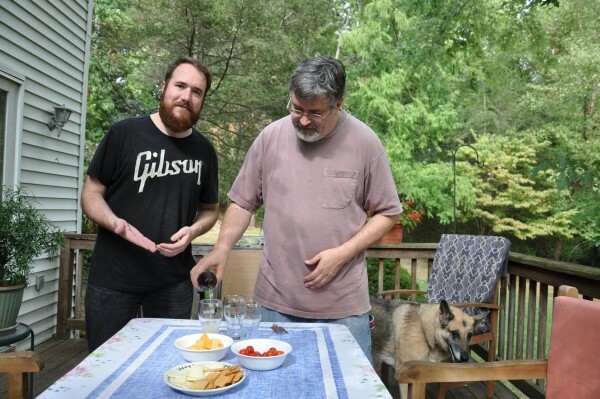 Thanks to Jan, Dr. Steve and PHOBoS for the Chat and port check today. Port 8088 is tested and ready to go! Photos of The Ginger Beer Session below by Linda Parson, 17 September 2016. 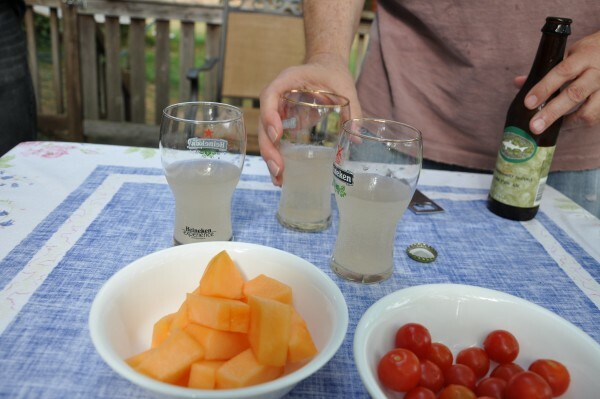 We opened our first batch of home-brew ginger beer, and it really turned out well. Not sweet, good alcohol content, and the ginger taste is not overpowering. Nice, clear, and bubbly. Excellent inspiration for improvising music. More pics from The Ginger Beer Session. Hey Dale, great stuff and love the pictures ! Can't wait to hear this. ZIM rig is growing I see professor Mine now has 2 mixers and the usual Quad FX and added a V-Verb from Behringer which has nice delay and reverb FX. Thanks, Bill! Yes, Jeremy located and Linda bought me the red Galaxy Audio AXS-10 for last Christmas. It has a more reedy sound than the Yamaha, second stereo bus, per-input compressors, and 3 Band EQ with Sweep Mids on Each Channel. The Sweep Mids is new for me, and is great for ZIM, because it allows you to change pitch more gradually without affecting feedback levels. It is perfect for ZIM. I get periodic discount emails at Musician's Enemy. Have one this week, am thinking hard about adding the Allen & Heath ZED-12FX, which is the one I was thinking about before last Christmas. Each one of the current 3 has a very distinct sound color when playing feedback. I have until the weekend to decide. I'll keep you posted about the next Kutztown planetarium event, which is likely to happen summer 2018, and will include ZIM work. Also, in a couple years I hope to do a distributed ZIM jam via Ninjam for one of our planetarium events. Keep your eyes on the forum! Nice hearing from you, Bill. and I'll try to make a banner/poster too, but if anyone else wants to do this, go ahead. I'd like to suggest that any live streaming event or concert, or musical event be "advertised" or announced on both the Front Page and on the Streaming Radio page. That way newbies will see it at first glance. Just because us oldies know when to expect one, and where to look for the info, doesn't mean that a newbie would. on the radiopage and/or frontpage. I was planning on doing it earlier but didn't get to it and didn't have any time today. I did post this event on the Facebook page for radio.electro-music.com. That gets a lot of views. Nice poster! I am hoping the fall hippie motif will inspire my inner flower child! Yes, very nice! Will repost on FB and my office doorway.